In order to effectively implement precision irrigation in the greenhouse, it’s helpful to understand the basics of a drip system and how modern sensor technology can enhance a drip-driven grow. Drip irrigation uses pumps and valves to precisely deliver irrigation down to the level of the individual plant. Using manual and automatic controls, the grower can leverage such a system to dramatically increase efficiency, delivering irrigation where and when it is required, thus reducing waste while maximizing yield. Installed at either the surface or subsurface level, drip systems eliminate runoff and evaporation by delivering water and fertilizer directly to the root zone. By giving plants exactly the amount of water needed at the right times, a drip system enables plants to take up nutrients more effectively. This in turn allows growers to minimize waste and better manage costs around nutrient dosing. In order to be most effective, a drip system typically will incorporate technological supports, including environmental monitoring and controls, as well as sensors designed to offer 24/7 awareness around moisture conditions in the soil. “The use of sensors can provide quantitative information to help guide and automate the decision-making process for irrigation,” according to the journal HortTechnology. In a smaller greenhouse, a standalone wireless sensor network may incorporate a series of individual nodes, with up to five sensors plugged into each measuring node. The nodes communicate with a base-station computer, and the grower in turn interfaces with the base station to monitor the data and to set irrigation parameters. A larger greenhouse may employ a more complex system of sensors and nodes, but the basic arrangement is the same: Measurements taken at plant level are forwarded to the grower, who can fine-tune irrigation as needed. Smartphone apps further allow the grower to manage precision irrigation even when not physically present. “With precision control, you determine when to water and how much to apply, which helps eliminate overwatering and conserves water from an environmental standpoint,” experts note. Specifically, sensors may measure soil moisture, temperature, and electrical conductivity, with preset calibrations for rockwool and soil mediums. A simple system may turn irrigation on or off based on sensor readings and user-defined thresholds. More sophisticated systems may model water demand, taking into account variables such as light accumulation, evapotranspiration, and leachate volumes to more proactively manage water delivery. In addition to monitoring the health of plants, sensors can be used for systemic monitoring, to ensure that all mechanical elements of the grow environment are functioning properly. Taken as a whole, these metrics deliver objective information to help optimize irrigation management. Wi-Fi connectivity makes for simplified setup, and connectivity to the cloud ensures the grower can always be in contact with the system. This fine degree of control leads to measurable cost savings. Some technology suppliers have seen a 40 to 70 percent reduction in irrigation with sensor-driven soil moisture management systems and precision irrigation delivery. While results can vary based on the details of a given operation, precision irrigation paired with environmental controls consistently leads to large reductions in water use. Better water usage drives more efficient use of nutrients and can reduce costs around fuel and electricity. 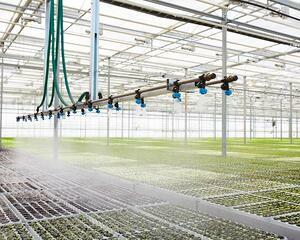 Precision watering likewise helps growers to meet environmental regulations through reduced leaching. This also reduces the level of runoff from herbicides, fungicides, and systemic pesticide applications. Faced with a growing population, a highly competitive agricultural marketplace, and the tangible impacts of climate change, growers in the coming years will be challenged to make optimal use of water resources. Precision irrigation brings water and nutrients to the plant with a high degree of accuracy, while sensors and controllers help growers to maximize their return on investment by delivering data-driven decision-making and control.